Happy 4th of July! This year, my family and I are celebrating on Amelia Island, off the coast of Florida on the Atlantic side. We are enjoying lots of time on the river, the pond, and the ocean. I could get used to this view. I'll have an weekend update post next week telling you all about what we get up to today and this weekend, but for now, we just have plans to hang out by the water today, and go downtown to listen to music on the square and watch fireworks tonight. I'm wearing my newest Old Navy dress (which is navy and white + linen, so I'm obsessed) and painting my nails and toes red for that bit of red, white, and blue. Also, this is sitting in my fridge and I'm extremely proud of it. I used white confetti cake, which was a bit of a mess because it was very crumbly, but other that that, it's looking pretty good. Here are the instructions I used, and you can click on the link if you'd like to follow the "from scratch" recipe. Keep an eye on my instagram to see the final product when I cut it tonight a la sparklers! "You will need (3) 9-inch layers. Bake lay­ers accord­ing to recipe or direc­tions. Let com­pletely cool. I make mine ahead of time and wrap in plas­tic wrap and store in the refrig­er­a­tor for a day. Once you have your red layer, your blue layer, and your white layer, you will need to slice the red and white layer hor­i­zon­tally with a long, ser­rated knife. This will be eas­ier if your cakes have been refrig­er­ated and are still cold. Cut them as evenly through the mid­dle as you can. These lay­ers form the stripes of the cake. Next, take one red half-layer, and one white half layer and stack them on top of one another. Take the whole (uncut) blue layer and set it in front of you. Place the stacked red and white layer on top of the blue layer. Check that they are evenly cen­tered on top of one another. Using a cir­cle tem­plate as a guide, cut a cir­cle exactly cen­tered through all three lay­ers of the blue, white, & red. For this 9-inch cake, I used the plas­tic lid off the top of a short­en­ing can. It was 5 inches. Try to get as close to this mea­sure­ment as you can so the color ratio looks right. Cut care­fully and thor­oughly, mak­ing sure you get all the way through all the layers. Next, sep­a­rate the blue from the red and white lay­ers. Take the mid­dle out of the blue. You won’t be using the blue cir­cle for this recipe, so set it aside. You now have a donut-shaped ring of blue. This will be the star field of your flag. Now remove the out­side ring from the red & white lay­ers. This is not used either, so set it aside. You should have a 5-inch cir­cle con­sist­ing of 1 white half-layer, and 1 red half layer. 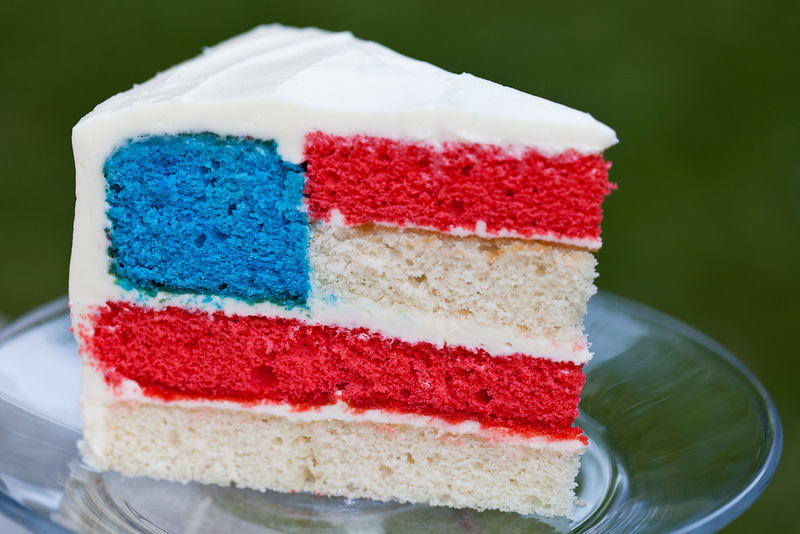 This will be the top stripes of your flag cake. Take the uncut white half-layer and cen­ter it on a cake cir­cle or cake stand. Spread a 1/8–1/4 inch layer of frost­ing over the top. Keep it as even as you can. Lay the uncut red half-layer on top of the frost­ing, mak­ing sure it is cen­tered. These make up the bot­tom two stripes of your flag. Frost like the last layer. Make it as even as you can. Now take the blue donut cir­cle and cen­ter it on top of the bot­tom stripes layer. Using a small off­set spat­ula or knife, spread a very thin layer of frost­ing around the inside of the blue ring. You don’t really want to see this layer of frost­ing, it’s just to help adhere the lay­ers. Plus, too much frost­ing, and your cir­cles won’t fit inside. Take the white 5-inch cir­cle and set it care­fully, but firmly inside the blue ring. Push it down as far as you dare. You want it as even with the blue as you can get it. Spread a thin, thin layer of icing over the white that is inside the blue ring. Place the red cir­cle on top and press down care­fully, try­ing to make the top lay­ers even. Now you are ready to frost! The recipe below makes about 5 cups of frost­ing. You will need all of it for a nine inch cake. Put a nice, thick layer on the out­side of the cake. You need to make up for the not-so-much frost­ing on the inside. Keep the cake refrig­er­ated until ready to serve. You can pull it out a bit ahead of time to take the chill off." Thank you, The Secret Life of A Chef's Wife, for the directions and recipe! As we know, today is all about celebrating our country and our freedom, so let's have fun, be safe, and overall thankful for our "home of the free because of the brave." Thank you to all who serve our country, wishing you the best July 4th yet! Oh my goodness that cake looks adorable...and delicious!! I'd have had a meltdown trying to get that down to perfection.